But, to be honest, somewhere along the line, I lost my trust in the labeling in our country. The wording must be written by some of my not-so-favorite attorneys from back in my court reporting days or something. It’s downright sneaky!“Fat free!” is in bold, colorful fonts on the front of packages, grabbing our attention, in hopes that we won’t see the small-, generic-font chemicals, additives, and preservatives that are making us sick hiding on the back of the label. I’ve gotten smarter and ignore all the fancy-shmancy front-label crap and go right to the ingredient list. Sometimes it’s okay; but most of the time, it’s shocking. I really wonder if the word “natural” has been edited in the dictionary. Everything nowadays is “all natural.” Yeah, right! So that’s food. We all know we have a problem there. We’ve found alternatives to most things in this house – coconut oil is a big one, used in many recipes around the kitchen, in our skincare and dental care. But one thing that I’ve not been able to settle on was a solid, tried-and-true facial moisturizer for myself. I tried straight coconut oil, and it was a little greasy, even for my super-dry skin. Searching online one day about six months ago, I found this aloe vera moisturizer. 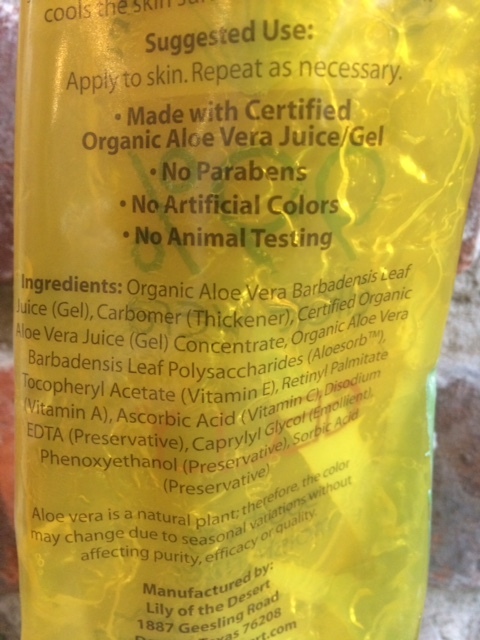 “Ninety-nine percent aloe vera” sounded/looked pretty “natural” to me. Since I was hurried in making my purchase, I bought it without looking closely at the ingredients. Yes, lots of good things – no parabens, animal testing, organic, etc. But why are there so many ingredients? Quite a bit more than just aloe vera, right?! I guess it goes without saying that I won’t be purchasing this product again. 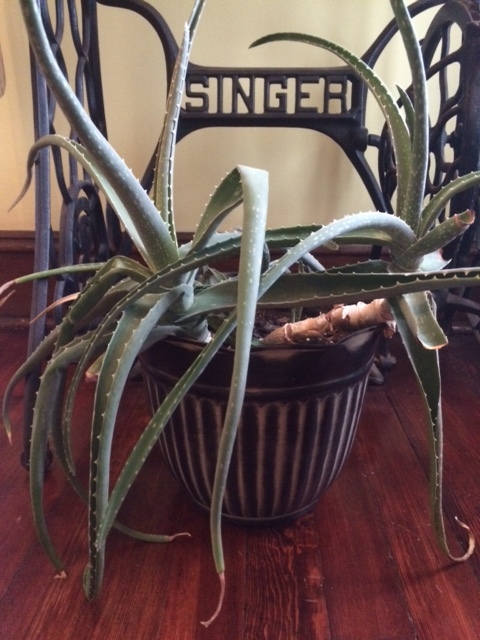 My aloe plant has been wondering what’s wrong with me through all my “natural” skincare purchases! Now that I have my facial moisturizer covered, I just have to worry about going over the ingredient lists of the crackers my kids want every time they’re in the store. For some reason, I think reading it again next week will change the ingredients I wasn’t so crazy about last time I looked. Oh, what a vicious cycle! Next > MYSTERY PATTERN WINNERS AND MYSTERY PATTERN REVEALED! Luv the article. In my office I have a copy of the ingredient list for the word natural on products. Can I just say it fills up 3/4 of an 8 by 11 piece of paper. Some where some lawyer is making a lot of money by finding a way to make it legal to promote this nonsense.